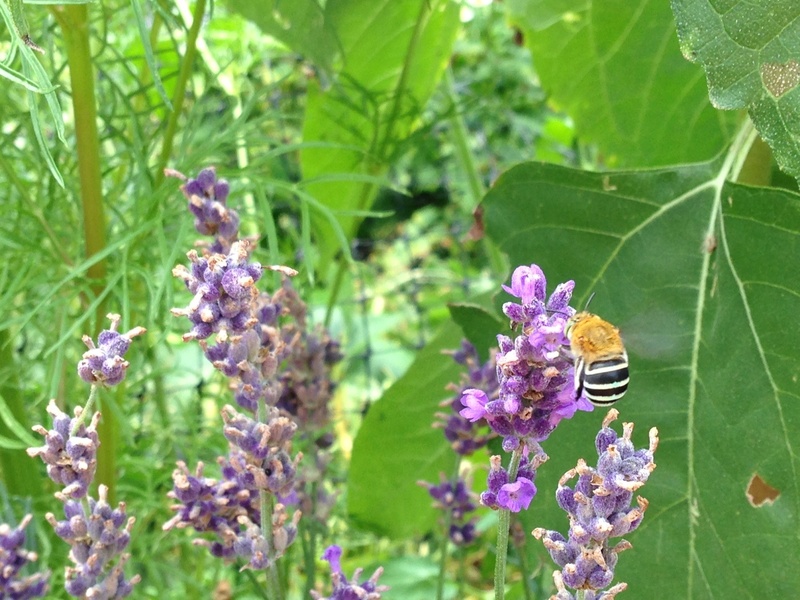 G2 took this shot of a beautiful Australian native blue banded bee on some lavender. We were so excited to find this bee in our garden. It’s much fatter than the European honey bee but a lot faster and its blue bands are visible in flight which is how it caught her eye. Blue banded bees are one of our most beautiful Australian native bees. They are about 11 mm long and have bands of metallic blue fur across their black abdomens. Blue banded bees are solitary bees. This means that each female bee mates and then builds a solitary nest by herself. She builds her nest in a shallow burrow in clay soil or sometimes in mudbricks. Many blue banded bees may build their nest burrows in the same spot, close to one another, like neighbouring houses in a village. Blue banded bees can perform a special type of pollination called ‘buzz pollination’. Some flowers hide their pollen inside tiny capsules. A blue banded bee can grasp a flower like this and shiver her flight muscles, causing the pollen to shoot out of the capsule. She can then collect the pollen for her nest and carry it from flower to flower, pollinating the flowers. Quite a few of our native Australian flowers require buzz pollination eg Hibbertia, Senna. Tomato flowers are also pollinated better when visited by a buzz pollinating bee. Researchers at the University of Adelaide are developing native blue banded bees for greenhouse tomato pollination. It would be much better for our environment to use our native blue banded bees for this purpose rather than introducing European bumblebees to Australia! Just found out about these bees myself. Wonderful!